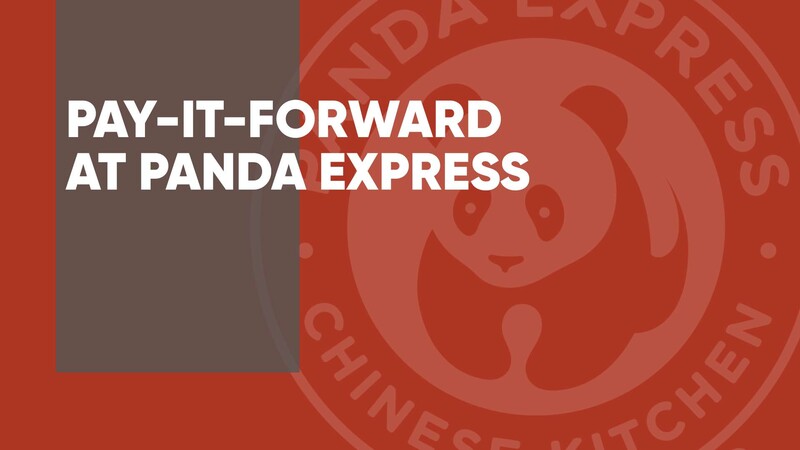 Sunday, October 14 | 12-3 p.m.
On Sunday, October 14, Shandon will partner with Panda Express on Forest Drive to help provide meals for those experiencing homelessness in our own backyard. From 12-3 p.m. that day, Panda Express will donate 20 percent of every meal purchased to an account for those needing a meal. In the Benevolence office, we’ll be able to offer people a hot meal and community with the funds raised as a result. Plan now to dine in or carry out after church that day, and help us Pay It Forward so that others can receive a meal, hear about God’s love, and be offered the gift of community – others like my friend, Smiley. Smiley was famous. He lived on the streets and would stand on the corner and dance in hopes of getting drivers to honk their horns. I first met him when he came in needing basic things like a toothbrush and soap. As I began to learn his story, it was one of loneliness, survival, and trying to find joy in simple things. I invited Smiley to a community dinner, not knowing if he’d even remember to come. About a week later, I looked up to see him walking from the house he was squatting in to join us for a meal! As he sat down at the table, something happened immediately: community. He had come across the street as one person, but as he sat and began visiting with others, he became part of something greater. As a church, we’re creating space for those in our community to know God’s love. There are many ways to get involved: You can serve on our benevolence team, volunteer on Mondays with our afterschool program at Hunter’s Way, give to the benevolence offering — and Pay it Forward at Panda Express on October 14!